I landed in a crouch. I stayed on my feet. I grabbed the handle of my suitcase and stood up. Less than a metre behind me, the train began to move. 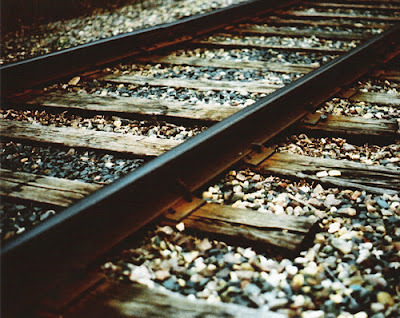 I quickly began walking away from the tracks. I looked up at the carriage I’d just jumped out of, and was amazed to see just how big a carriage actually is. As the train moved off behind me I expected to hear a whistle or a shout or even the train suddenly brake to a halt. And as I continued to head away from the tracks, I made sure that I walked calmly and with erect posture, instead of trying to sneak away (which would have been useless anyway, since there was no cover). I had done something dangerous and most likely illegal – but I wasn’t afraid that I had done what I did, and if I was caught I would take responsibility for my actions. But the train departed without incident. At first, I thought that I could exit the station via a storage yard right next to the tracks. But I soon discovered that there was no open exit to the road on the other side of the tall wire fencing. And without a ladder, I’m a lousy climber. So back to the tracks I went, and then to the end of the platform with its locked gate and the attached sign that warns CityRail passengers not to exit this way. I mounted the steps up to the gate, dropped my suitcase over it and prepared to awkwardly climb over it…but I became worried that that wouldn’t work either. So I got down, returned to the ground, saw a nice-looking spar underneath the end of the platform, and used that to ladder myself up onto the platform. Apart from someone down at the far end of the platform departing the station, I was on my own. I grabbed my suitcase and began heading down the platform. A moment later, another CityRail train appeared and hurtled past the station. About 15-20 minutes later after walking through quiet country-town streets, I arrived at the community centre. I was half an hour early. And I also very badly needed to go to the toilet. As I’d approached the community centre, I’d hoped that there would be an open public-toilets block there as well…but alas, no. So, after leaving my gear at a table near the BBQ area, I walked into the nearby bushes, stood with my back to the houses a couple of hundred metres away, and hoped that anyone seeing me would think I was simply admiring the bushland view ahead of me. About five minutes after that, I was sitting at the table with my iPad when several cars arrived at the community centre. A few mums and several young girls got out, some of them laden with covered food-bowls. A moment later, one of the mums came over, set down her covered item at the BBQ and kindly told me that she was leaving some food there for a party that was due to start soon. I said no problem, and that I would be moving shortly anyway. Shortly after that, I gathered up my stuff again and moved over to the community centre building. Eventually, everyone else showed up. My friend unlocked the community centre, we all went in and spent the next couple of hours rehearsing. It was late afternoon when we finished, and after my friend locked up the centre we went our separate ways. As I began my trek back to the station, I saw two cars coming up the street towards me that once again made me paranoid at first. The first car was a non-descript white sedan – but the second car was a large white 4WD with red-and-blue siren lights mounted on its roof. Was this the police, coming to look for someone who had been reported, and perhaps even been filmed by security cameras, jumping off a train at the local station a couple of hours ago? If so, I maintained course and prepared to take responsibility if confronted with what I’d done. …but the 4WD was an emergency rescue vehicle, and its driver and the sedan’s driver got out and unhurriedly went into a nearby home. About 15-20 minutes later I was back at the station, which was still deserted. Another 15-20 minutes after that, the next train to Central arrived. The journey home was completely without incident. That evening, and for the next few days, I thought a lot about what I’d done. I even did a brief online search to see if anyone had filmed me and posted it, but there was nothing. I also visited CityRail online, and was amused by the first sentence on this page. …but at the same time, not only was I stunned that I had done it and that it had all happened very quickly, but in the moment it had seemed like a logical thing to do. Before mid-2007, I wouldn’t have even considered doing what I’d done. Instead, I would have stayed on the train, missed the rehearsal and spent the rest of the day (and the next day or so) being furious at myself, CityRail and the world. Do I regret doing what I did? No. Would I do it again? Perhaps. I hope I never have to do something like that again, but if I do I know that I could. This entry was posted in Action, Confidence, Life Challenges, Life Strategies. Bookmark the permalink.